If you love dogs and you love nature, whether you are travelling as couple, family or small group of friends, Bushcraft, Canoeing and Hiking with Huskies in Kainuu may be your perfect holiday! 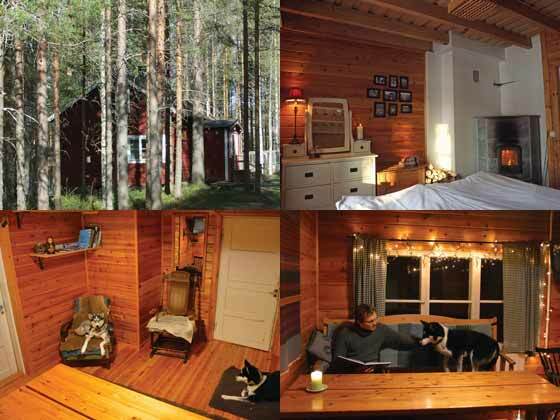 Located in the eastern part of Finland, close to the Russian border, and beautifully-situated on the shore of a lake 2km from your nearest neighbour, the cabin at the kennels is your base for five days of nature-based activities led by your local hosts and revolving around the huskies and the rich bounty of the surrounding natural environment. With the huskies on the doorstep, there's plenty of opportunity for a cuddle! Photo: RT. Able to accommodate up to max. 4 persons (or family of 5) travelling together, it will be only yourselves and your local hosts staying in the cabin at the kennels. Taking part in the daily life of the kennels, including feeding and socialising with the huskies. Hiking with huskies in the forest. Fishing (if you wish) using traditional techniques in the lake adjacent to the cabin. Foraging for produce from the surrounding forests such as berries and mushrooms (varies depending on time of year of your visit. General nature and outdoor activities such as lunch outdoors around the fire and learning about the nature of the area. As a private experience, activities can be tailored to your interests. Photo: RT. Your accommodation is in 2-person rooms in your hosts' house at the kennels, which is simple but very cosy and welcoming. The wood-fired sauna, right by the lake and just a few metres from the cabin, is available daily and provides not only an opportunity to wash but is also the perfect ending to any day in the Finnish outdoors, especially if you jump in the lake afterwards! Available on flexible dates by arrangement between May and September, Bushcraft, Canoeing and Hiking with Huskies in Kainuu is a flexible and very personal experience living very much in harmony with nature. Transfers are included from Kajaani airport. Transfers are also available from Kuopio as an optional extra. After collection from the airport you are transferred to the husky farm, where you first meet your new furry friends and settle into life at the kennels. Dinner and meals throughout use local ingredients as far as possible such as fish caught from the lake next to the kennels and produce from the surrounding forests. Below is the standard itinerary. However, as a private tour, the order of activities, the particular activities included and the focus of your stay can be adapted to a certain extent depending on your requirements. Your local hosts will discuss your preferences on arrival. Explore the local area and forage for the tasty wild treats it has to offer. The area is rich with mushrooms, berries, edible plants and herbs and the "Everyman's Right" in Finland means that you are welcome to collect these delicious ingredients as long as you don't disturb wildlife or get too close to your neighbours - but that is no problem at the kennels, as your closest neighbour is 2km away! Each evening you will have the opportunity to enjoy a Finnish sauna, which is traditionally combined with a dip in the lake! Dinner is made using the ingredients you have foraged throughout the day. Food for the huskies during the summer months is mostly fish from their lake, which your local hosts have caught using a fyke net, a fish trap that mostly catches small fish such as Roach. This method takes a little time and energy, but it is worth the effort for the lower carbon footprint. In the lake you can also find Pike, Perch, Zander and Whitefish, which you will try and catch for your dinner! Kuhmo offers many nature trails and today you will explore the area with some happy huskies and go for a hike in the forest. Hiking with huskies is a special experience, leaving you wondering who took who for a walk. Each person borrows a special belt, a shock-absorbing leash and husky for the day and your role is to follow and slow them down on trickier paths as the huskies are keen to do what they do best, which is pull! Being with the dogs gives a unique perspective on the forest and helps you tune your senses to the nature around you. Lunch is by the fire and you'll need to save some sausages for the dogs. 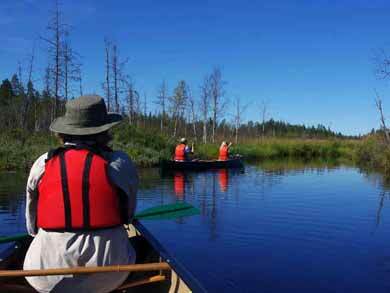 A short introduction to canoeing will take you through the basic techniques to prepare you to begin a tour right from the shore of the cabin. You may be lucky enough to spot some beaver or at least see evidence of their impact on the local ecosystem. Lunch and coffee will be enjoyed by the open fire. 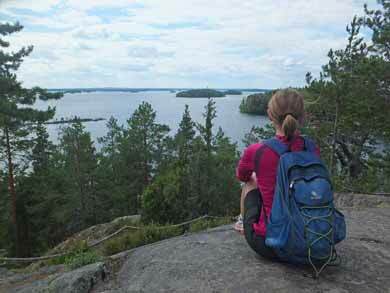 Your final day will be spent hiking in the pathless forests in the local area. There are many areas that are protected and have no footpaths, fireplaces or other services for hiking, making these wonderful for exploring nature where others rarely tread. These areas are important for preserving nature in its original form and here you can really feel at one with your surroundings! Breakfast followed by time to say goodbye. Transfer to Kajaani airport is included and is also available to Kuopio as an optional extra. Flexible dates by arrangement between 15th May and 30th September (latest end date 30th September). NB: This is a private experience suitable for 2-4 persons. Whether you are travelling as 2, 3 or 4 persons, there will be no other guests staying at the husky farm at the same time. Please note, however, that there may be other persons joining some of the activities (e.g. husky hiking) as day participants. This experience is normally suitable for up to 4 persons, but can also accommodate a family of 5. Price for 5th person is as for 3rd/4th persons. Transfer from/to Kuopio: Transfer from/to Kajaani is included and the majority of guests will choose this option. If you prefer to travel to/from Kuopio for arrival and/or departure, which can sometimes offer more regular or more affordable connections, transfer is available as an optional extra. Extra night at hotel: Half board (dinner + breakfast) in standard room or suite* in lakeside hotel on the edge of Kuhmo. NB: Prices given do not apply during the Kuhmo Chamber Music Festival, which takes place annually, normally in the last two full weeks of July (dates for 2019 are 14th-27th July). During the period, availability will typically be very limited and prices higher. Please contact us for details and prices if you wish to stay during this time. *Standard room has twin/double bed, size 21 square metres, shower/WC, hairdryer, flatscreen TV, radio; Suite has bedroom, living room and large bathroom, size 38 square metres, jacuzzi/WC, hairdryer, flatscreen TV, radio, telephone, minibar and bathrobes. Hotel offers spa facilities with 4 saunas (including male/female standard saunas and infrared sauna) and 2 hot tubs. Use of the standard saunas is included before dinner. Other saunas and the hot tubs are available to book locally at additional charge. Choice of massage and other spa treatments available to book locally. Free wi-fi. Accommodation: 6 nights' accommodation in your hosts' house at the kennels, which has 2 x 2-person rooms for guests (up to 4 adults or a family of up to max. 5 persons can be accommodated, using extra bed in one of the rooms). Your share living are and bathroom faciltiies together with your hosts. Note that there is no shower at the cabins - the sauna provides an opportunity to wash with hot water and the lake is ideal for swimming. Bed linen and towels are included. Meals: All meals from dinner on arrival to breakfast on departure. Activities: A range of bushcraft/nature/husky-related activities as per itinerary. Exact activities and focus of your stay are to a certain extent flexible depending on your preferences and interests. Transfers: Included from/to Kajaani or Kajaani airport on arrival/departure. Available from Kuopio as an optional extra if you choose to travel there rather than Kajaani. Accommodation at the Husky Farm. Alcoholic drinks: If you wish to purchase alcoholic drinks, your hosts can arrange for you to visit the store in Kuhmo. General good health and level of fitness and interest in nature and the outdoors. This is experience is suitable for both adults and children (min. age 6). Due to limited washing facilities, the experience is not suitable for families with infants. The level of challenge and activities features in the itinerary can be adpated to suit the needs of children and, if necessary, one adult can of course stay back at the cabin with younger child(ren) if other members of the family wish to participate in activities that would not be suitable for all. You should be comfortable sharing living facilities with your local hosts and living closely with dogs. All life at the kennels is closely connected with the huskies - you will be working with the dogs during your stay and there may also be dogs inside the cabin at times. Guests must not be allergic to animal hair. The tour is guided by your local hosts and the itinerary is flexible to a certain extent depending on your interests and preferences. The intention is that the experience should include working with/walking the huskies, fishing (if you wish) and walking in the forest, often over rough and sometimes pathless terrain. You should be comfortable being outside for extended periods. Note: Ticks occur mostly in grassy areas. As in the UK and other areas, there are ticks in the Nordic forests which can carry diseases such as Borrelia. You should check for ticks at the end of a day in the outdoors. If you find a tick, remove it as soon as possible by pulling the tick out straight, carefully and slowly, with the tweezers as close to the skin as possible. Ensure that you do not leave any of the insect's mouth parts attached to your skin. Wash the bite area with soap and water. In the unlikely event that you feel unwell or notice anything unusual around the area of the bite in the coming days, consult your doctor. As in large areas of mainland Europe, in some small, localised areas of the Nordic countries (mostly in the Stockholm Archipelago), the ticks are known to carry TBE, or Tick-borne encephalitis, and locals spending extended periods in affected areas often choose to vaccinate themselves. For more information and latest updates, please see Tick Alert. For current advice on TBE and inoculations for the area you are visiting, please consult your doctor or see Travel Health Pro. You can also see a map showing areas where cases were reported in 2016. This experience can accommodate up to max. 4 persons, so is ideal for one couple, two couples travelling together, family of up to 4 persons or small group of friends. This provider has a detailed written environmental policy. The dogs at the kennels are fed largely on fish. Offcuts from a local salmon fish-farm make effective and nutritious use of a waste product, and the dogs' diet is supplemented with an overabundant species of roach caught by hand nets in the lake adjacent to the kennels. This not only provides a sustainable and low-impact high quality food source, but also contributes to the conservation of the lake ecosystem, as removing this species helps to reduce the disturbance of sediment and combats eutrophication of the water caused by local forestry activities. The taiga forest, also known as the boreal or snowforest, is the world's largest biome and consists mostly of coniferous forest including pines, spruces and larches. It stretches virtually unbroken around the world, across Canada, Alaska and parts of the northern USA. In Europe it covers large parts of Sweden, Norway and Finland, some parts of Iceland, and much of Russia, as well as areas of Kazaskhstan, Mongolia and Japan. Fly to Helsinki for travel by day train (6 hours) or domestic flight (1 hour 15 mins) to Kajaani, from where transfer to the kennels (90 mins) is included. Read about Bob's visit to the kennels on the Nature Travels blog. In wintertime, this is the location for Private Dogsled Tours for Two in the Taiga Forest.